Happy St. Patrick’s Day and Fet Damballah! Huh? You might say. Well, I am a bit ambivalent about St. Patrick’s Day. I mean, here in the U.S. it’s celebrated as an excuse to get drunk and act like an idiot—in other words, to act like the stereotype of the drunken Irishman, the type for whom the “Paddy Wagon” was named. Now, is that really any way to celebrate a saint and an ethnicity? Others in the U.S.—which has more people of Irish descent than Ireland does—celebrate it as a way to honor their Irish ancestry. Maybe it helps make up for the shoddy treatment the Irish received in the U.S. when they first immigrated—especially the poor ones. So if you haven’t seen Martin Scorsese’s wonderful film Gangs of New York, about the fights between the Irish immigrants and the Nativists, I highly recommend it. St. Patrick allegedly brought Catholicism to Ireland—the “snakes” he drove out were, symbolically, the pagans, for there were never any snakes in Ireland; it’s too cold. I feel very bad for the Catholics of Ireland. They suffer in many ways, not the least of which is from repressive Catholic practices such as the condemnation of birth control, divorce, and abortion. Yet I am proudly Irish at least by descent from the Catholic variety, as one of my great-grandmothers came from County Cork. But St. Patrick, who allegedly died on March 17th, didn’t drive out the snakes at all. He merely transformed them. Much of Ireland’s pagan past survives in folk tales and beliefs about the “little people” and all sorts of magical stuff. Even the Celtic-style cross is an amalgam of the Christian cross and an earlier pagan symbol. And of course, the international religious organization to which I belong, the FOI, is headquartered in Clonegal Caste in Enniscorthy, Eire. In Vodou, however, an image of St. Patrick is often used to represent Damballah, the “serpent” portion of the god-and-goddess couple known as the “Serpent and the Rainbow.” Damballah Wedo and Ayida Wedo represent the union of earth and sky. White is Damballah’s main color, but green is given as a secondary color. March 17th is his feast (‘fet’) day. Damballah, and all his variations, including Blanc Dani in New Orleans, is descended from the ancient African god Da, a creator deity. So how did he end up being portrayed as an old white man with a bunch of snakes? Because of the snakes, of course! 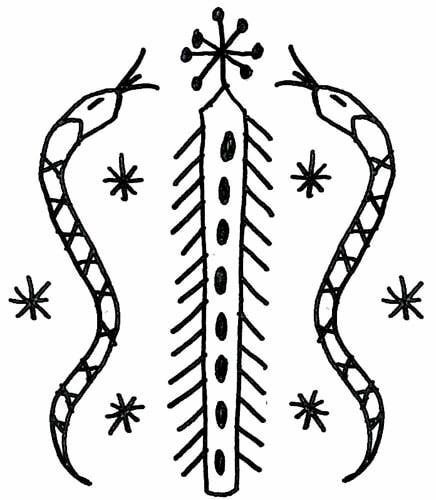 Serpents are not evil in most pagan traditions, and they aren’t evil in Vodou. 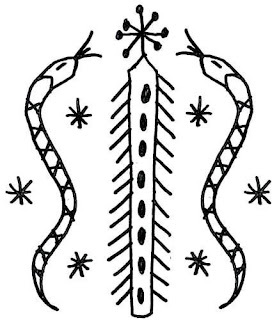 Many hounfos (Vodou houses) will have a snake, usually a white snake, in residence. Damballah is honored with an altar that contains white eggs, white flour, and a white altar cloth. Ironically, perhaps, he does not drink alcohol and is served orgeat syrup or another sweet non-alcoholic drink instead. In New Orleans, St. Patrick’s Day bleeds over into St. Joseph’s Day, a special feast day for the Italians in the city. St. Joseph is one of their patrons, keeping away famine, so many Italian Catholics celebrate the day with huge altars covered with food, and many of them open their homes to the public to feed their friends and anyone who needs it. St. Joseph’s Day is also the second-most important day for the Mardi Gras Indians, African Americans who dress up and vie with each other’s “gangs” to make the prettiest costumes. Why choose this day to do so? Some will say it is convenient, since the Italian Americans often have a parade on this day in New Orleans, too. Others might say it has something to do with the fact that this is the Fet Papa Loko, the feast day of Papa Loko, the agricultural god who knows about healing herbs and, as with St. Joseph, helps keep famine away. So in both New Orleans and Haiti, March 17th through March 19th are busy days for Vodouisants. And we haven’t even mentioned the Vernal Equinox yet; this year it arrives the day after St. Joseph’s Day. It is common for big Catholic ceremonies to coincide with formerly pagan celebrations; again, it is easier to overlay a party that is already in progress with a new theme than it is to cancel the party and then start your own. So Happy St. Patrick’s Day. Just don’t drink and drive. I hadn't heard of these; basically they sound like zeppoli with cannoli filling. Zeppoli are essentially the same as beignets, but instead of being square, they're round. When I make beignets they're technically zeppoli, since I don't cut them into rectangles; I just use the beignet mix and fry them as little balls. Had not heard of stuffing them with cannoli filling, however!